On Saturday April 16th we will be joining forces with the Milwaukee MINIs and enjoying some fun roads in the northern Illinois and southern Wisconsin area. Full details are not yet ready, but our ending destination will be a late lunch in Bristol Wisconsin. Here is the hotel info in advance for our overnight trip to New Glarus on May 21st and 22nd. We will have drive meetup and time details as the event gets closer. WRAPUP: Sunny spring weather made for an excellent drive!! 35 MINIs of all colors and styles met up for the start. Lots of new and potential members, and lots of old friends. We headed out for a 40 or so mile drive around the western suburbs on lots of nice twisty back roads. We parked up at the top of a parking garage for a short photo op, and then went on to enjoy a nice lunch at The Filling Station. Huge thanks to Paul and Barbara for all the planning for this event!! It is almost time to get your MINI all cleaned up for spring, and our friends at Dr. Beasley’s have offered the Chicago MINI Motoring Club a discount on their Online Store detailing products. 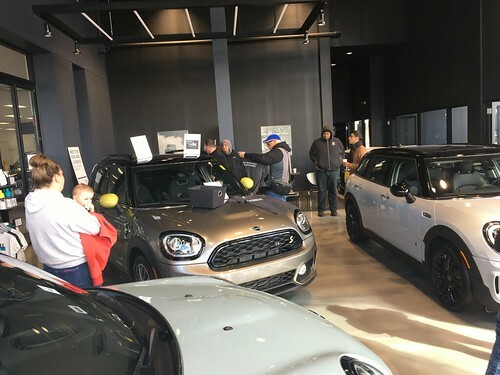 We usually work pretty hard to keep our MINIs clean, but Chicago based Dr. Beasley’s, Inc and Simon’s Shine Shop have partnered up and are running a contest to find the dirtiest car. Grand prize is a full detail, and several other prizes are available as well. Contest ends Friday February 25th.